Joe Rafferty has plenty to thank a Deepdale old boy for. 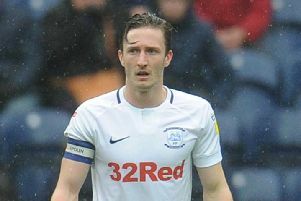 The full-back became Preston North End’s fifth signing of the January transfer window when he signed on the dotted line on Wednesday. A former Liverpool youngster, Rafferty arrives having played more than 250 games for Rochdale. At Spotland he was a team-mate of ex-PNE midfielder Brian Barry-Murphy, with the Irishman now a member of Keith Hill’s coaching staff. Barry-Murphy spent just over three years with the Lilywhites, leaving in January 2003 and having spells at Sheffield Wednesday and Bury before joining Dale in 2010. “Brian has a been a big influence on me,” said Rafferty. “From the moment I signed for Rochdale he has helped me all the way through from when I was a young lad to now. “I was only 18 when I joined and he looked out for me from day one. “He was a player when I first signed and then he’s moved into the coaching side of things. “He didn’t know much about this until the move was pretty close and as soon as he found out he was absolutely buzzing about it. “He told me everything about Preston and said he had the best years of his career here. “He couldn’t speak highly enough of the club. Rafferty landed at Rochdale in 2012 after failing to nail down a professional contract at Liverpool. Having joined the Anfield ranks at the age of nine he lined up alongside one famous name in particular. “I played with Raheem Sterling,” said the Republic of Ireland youth international. “He’s a little bit younger than me but he was playing up with my age group. “I also came through with Jack Robinson who’s at Nottingham Forest now. “There was Jon Flanagan as well and a few players who are playing a bit further down. After leaving a Premier League club as a teenager, Rochdale offered Rafferty his first chance of senior football. It was a chance to really make his way in the game and six-and-a-half years later that certainly turned out to be the case. “When I left Liverpool and went straight to Rochdale I just wanted to play matches for the first team,” said the 25-year-old. “I just wanted to get involved and see how far I could go. “I got my head down and played a good amount of games for Rochdale and have been luckily enough to get this move now. “I’ve played consistently over the last seven seasons and we achieved plenty while I was there. “We’ve won promotion, we finished the highest the club has ever finished, got the most points the club has ever got, went to Wembley and had good FA Cup runs.